Tonight after dinner we caught Luke quietly playing by himself. 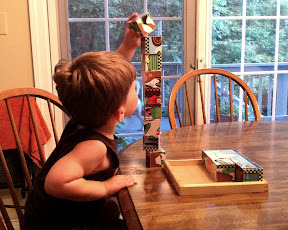 He was sitting at the table stacking blocks. When he couldn't stack the blocks any higher while sitting he'd sneak a little stand on the chair and deposit the next piece. Anytime Alyce would get close to his tower Luke would run over to protect it saying "mine mine".